Historic Guest House from the early 1930s made entirely of stone. Dawn and Ken have refreshed the interior with newly sanded "pumpkin pine" floors and warm, decorator wall tones. There is over 1000 of living space. The bath fixtures are original from the 30s and the huge stone fireplace has propane fired gas logs for cozy winter nights. The large first-floor great room also has a small coffee service with a 1935 Frigidaire refrigerator filled with cold drinks. Amenities include freshly laundered soft cotton bedding and towels, bathrobes, hypoallergenic or goose down pillows, cozy sofas, and chairs, comfortable carpeting, and rugs. The linen closet has an ample supply of bar soaps, shampoos, a hair dryer and a first aid box. The spaces are accessorized with old framed artwork, mirrors, clocks and folk art. We offer a quiet, relaxing experience without TV, with old books, old magazines, and games to enjoy a special time with friends or loved ones. Excellent wireless service to keep tabs on the world if you need to. The beds are a king sized and a standard full sized. The south bedroom offers an antique double. We provide a complete list of emergency info in the unlikely event that you would need it. Granby is an "upscale", small suburban Hartford community with tons of nearby amenities and located in an area known for working dairy farms, equestrian centers, apple orchards and farm wineries Our beautiful community also offers self-serve farm stands, homemade ice cream stores, art galleries, country libraries as well as gourmand evening dining establishments. Connecticut is home to many historic covered bridges, waterfalls and a few ghost towns. See our local guidebook for more details. Book this 2 bedroom cottage in North Granby today! A total of 4 people can sleep here comfortably. Guests can enjoy air conditioning, parking space, and internet access among other amenities offered by this rental. Dawn and I are an "empty nest" couple with a love for hospitality. We currently own an older Cape Cod home in North Granby, Connecticut. The property includes our stone guest house with 2 bedrooms, a bath and a living room with a massive stone fireplace. Dawn has a furniture restoration business and Ken has been in real estate sales for over 40 years. We love country antiques and decorating with a vintage style. Ken is involved with the local historical society and has served on the town Economic Development Commission for over 10 years. Please see our Guidebook for many ideas of what you can do when you stay with us. Granby is a beautiful quiet New England town to relax, unplug and revive your life. Our property will fulfill all the reason folks need a little get a way! Located in an area with breathtaking views of Massachusetts (walk just a little more than a half mile to the amazing Mary Edwards Property), this area Connecticut is known for its working dairy farms, apple orchards, farm wineries and is a horse loving community. Our beautiful community also offers self-serve farm stands, homemade ice cream stores, country libraries as well as upscale evening dining and art galleries. 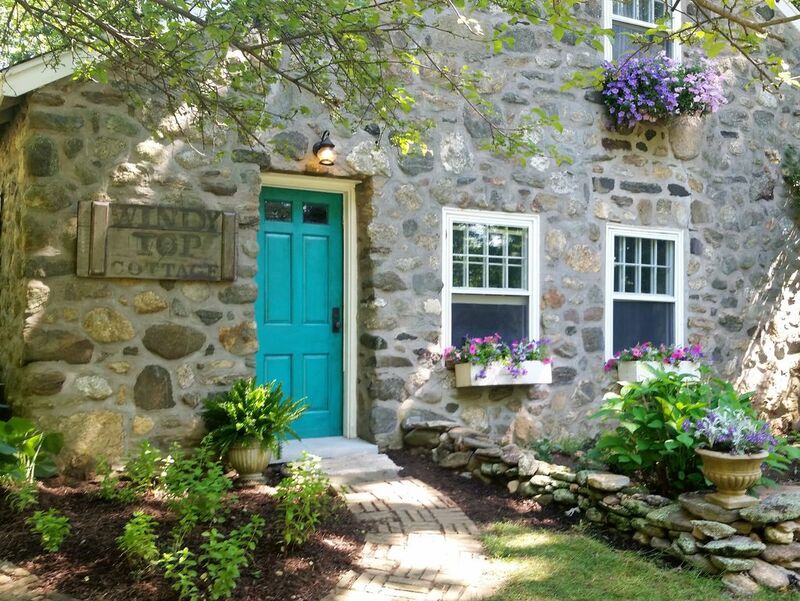 Windy Top is in the heart of Connecticut's best private boarding schools. 7 of the top schools in Connecticut are located within 20 miles of the cottage. These schools include... Ethel Walker and Westminster Schools in Simsbury; Suffield Academy and Loomis-Chaffee Schools; Miss Porter's in Farmington, Kingswood-Oxford in West Hartford and Avon Old Farms School in Avon, Connecticut. Our cottage is a rare opportunity to stay in European style stone guest house for a special event or just a romantic getaway! The bath fixtures are original from the 30s . New plank style flooring. The linen closet has an ample supply of bar soaps, shampoos, a hair dryer and a first aid box. Propane forced warm air heat. Amenities include freshly laundered soft cotton bedding and towels, bath robes, hypo allergenic or goose down pillows, cozy sofas and chairs, comfortable carpeting and rugs. Wifi available throughout the structure with the use of a wifi extender which is provided. 1935 Fridgedaire filled with ice cold drinks. Old books, magazine and games. Old stone patio screened from the main house with seating and dining options. We can offer, as an extra, small special packages like S’Mores in the Fireplace, Champagne & Cheese/Crackers, Breakfast in Bed! Let us know in advance. We had a wonderful time. The owners were so friendly and the cottage was lovely. A real relaxing time away.